Sheena Rogers Designs. Halloween House Pincushion Cross Stitch Kit. This is for a kit, not a completed pincushion. (Zombie hand not included!). This pincushion cross stitch kit includes: 14HPI white aida fabric, ready-sorted DMC Stranded Cotton Threads, needle, backing fabric, b&w symbol chart and instructions. Only whole cross stitch is required (no fractionals) with backstitch needed for the finer details on the pumpkin and the cobwebs. Sheena Rogers Designs. This spooky Halloween mini cushion cross stitch kit includes: 14HPI white Aida fabric, ready-sorted DMC stranded cotton threads on a card sorter, needle, black velvet backing fabric, b&w symbol chart and full instructions (cushion filler not included). 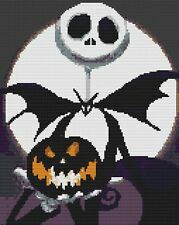 Nightmare Jack Counted Cross Stitch Kit. Enjoyable to sew for both the novice & experienced cross stitching enthusiast! 18 colours. Pre-sorted Anchor Thread on Thread organiser with corresponding symbols. Moonstruck Beaded Counted Halloween Cross Stitch Kit Mill Hill MH141626 Buttons & Beads 2016 Autumn by Mill Hill. Model Number: MH141626. Moonstruck Beaded Counted Halloween Cross Stitch Kit Mill Hill MH141626 Buttons & Beads 2016 Autumn. Nightmare B4 Christmas 9 Counted Cross Stitch Kit. Enjoyable to sew for both the novice & experienced cross stitching enthusiast! 14 colours. Pre-sorted Anchor Thread on Thread organiser with corresponding symbols. Sheena Rogers Designs. 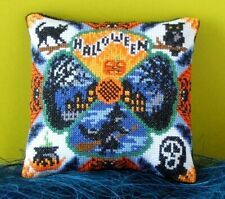 Halloween Village Mini Cushion Cross Stitch Kit. This mini cushion cross stitch kit includes: 14HPI white aida fabric, ready-sorted DMC Stranded Cotton Threads on a card sorter, needle, backing fabric, b&w symbol chart and instructions (cushion filler not included). Halloween Fairy Counted Cross Stitch Kit. Enjoyable to sew for both the novice & experienced cross stitching enthusiast! 22 colours. Pre-sorted Anchor Thread on Thread organiser with corresponding symbols. Happy Halloween Ghost Cross Stitch Kit de Florashell Cross Stitch Design. El kit contiene todo lo necesario para completar el cuadro. A continuación puede encontrar una traducción automática al español. MOUSELOFT CROSS STITCH. Bat, a counted cross stitch design. The kit contains All designs fit within a 64mm circle, so are ideal to make into cards! Aida fabric (14hpi) embroidery threads, needle and full charted instructions. MOUSELOFT CROSS STITCH. Ghost, a counted cross stitch design. All designs fit within a 64mm circle, so are ideal to make into cards! 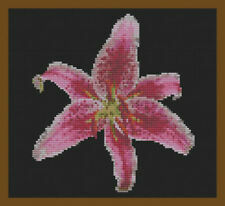 The kit contains Aida fabric (14hpi) embroidery threads, needle and full charted instructions. Stitched on 14 count Aida fabric with 7 colours in full cross stitches. The kit contains everything needed to complete the picture. Three fold card and envelope. Detailed instructions. Clearly printed chart. MOUSELOFT CROSS STITCH. Frankie, a counted cross stitch design. The kit contains All designs fit within a 64mm circle, so are ideal to make into cards! Aida fabric (14hpi) embroidery threads, needle and full charted instructions. MOUSELOFT CROSS STITCH. Pumpkin, a counted cross stitch design. The kit contains All designs fit within a 64mm circle, so are ideal to make into cards! Aida fabric (14hpi) embroidery threads, needle and full charted instructions. MosaiCraft is a unique craft which is similar to both mini mosaic and paint by numbers. It consists of small colourful plastic pixels, which make up beautiful designs by being placed on a clear base board, with the use of tweezers and easy-to-follow design sheets. MOUSELOFT CROSS STITCH. Witch, a counted cross stitch design. The kit contains All designs fit within a 64mm circle, so are ideal to make into cards! Aida fabric (14hpi) embroidery threads, needle and full charted instructions. MOUSELOFT CROSS STITCH. Spider, a counted cross stitch design. The kit contains All designs fit within a 64mm circle, so are ideal to make into cards! Aida fabric (14hpi) embroidery threads, needle and full charted instructions. Happy Halloween Owl Cross Stitch Kit de Florashell Cross Stitch Design. El kit contiene todo lo necesario para completar el cuadro. A continuación puede encontrar una traducción automática al español. The Witch & The Moon Counted Cross Stitch Kit. Enjoyable to sew for both the novice & experienced cross stitching enthusiast! Pre-sorted Anchor Thread on Thread organiser with corresponding symbols. 12 colours. Riolis Kreuzstich-Set "Fröhliches Halloween", Zählmuster, nicht vorgezeichnet. Riolis Kreuzstich-Set "Elefant", Zählmuster. Riolis Stickbildset Kreuzstich "Omas fröhliche Gänse", Zählmuster. Riolis Kreuzstich-Set "Lop-Ohrenhase", Zählmuster. Sheena Rogers Designs. Halloween Party Mini Cushion Cross Stitch Kit. This spooky Halloween Cross Stitch Kit includes: 14HPI white Aida fabric, ready-sorted DMC stranded cotton threads on a card sorter, needle, backing fabric, b&w symbol chart and instructions (cushion filler not included). Stitched on 14 count Aida fabric with 7 colours in full cross stitches. The kit contains everything needed to complete the picture. Three fold card and envelope. Clearly printed chart. Gold plated needle. 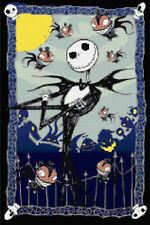 Kids' Halloween Cross Stitch Kits x 5. 6 different yarn colours - yellow, red, green, black, purple and orange. Add colourful cross stitch to these spooky characters. 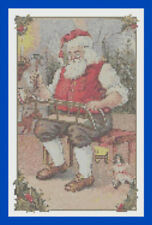 Cards can be coloured in before adding cross stitch. Kit completo punto de cruz contado. Halloween Series- No. 42-101 KIT. Model Black Cat on Jack-o-Lantern. MPN 42-101 KIT. (que tiene símbolos de buen tamaño, lo que es fácil de leer). Al realizar un pedido desde los EE. El juego de puntadas cruzadas estan estampados 11CTPunto de cruz de alta gama y preimpreso de alta calidad y 100% precisosEs mucho mas facil mas divertido y mas rapido terminar.La puntada llena utiliza generalmente 3 filamentos del hilo, la puntada trasera utiliza 2 filamentos del hiloIncluye: Tela, hilo suficiente, agujas, espera la carta de colores, instrucciones en Ingles.Tamano: los 20 * 46cmMaterial: AlgodonContenido del paquete: 1 x Juego de Punto de cruzNota: Los disparos de luz y diferente pantalla pueden hacer que el color del elemento de la imagen un poco diferente de lo real objeto. El error de medicion permitido es /- 1-3 cm. UPC 192090022298 EAN 192090022298 ISBN 192090022298 MPN No aplicable Brand Sin marca Marca Un. Stitched on 14 count Aida fabric with 8 colours in full cross stitches. The kit contains everything needed to complete the picture. Three fold card and envelope. Clearly printed chart. Gold plated needle. A Small counted cross stitch kit from Mouseloft. Halloween Pumpkin. Escena de Halloween. Kit completo punto de cruz contado. Halloween Series- No. 42-100 KIT. Model Halloween Scene. MPN 42-100 KIT. (que tiene símbolos de buen tamaño, lo que es fácil de leer). Al realizar un pedido desde los EE. 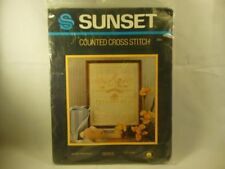 A Small counted cross stitch kit from Mouseloft. Halloween Frankenstein's Monster. A Small counted cross stitch kit from Mouseloft. 14 count Aida, thread, needle, chart all included. A Small counted cross stitch kit from Mouseloft. Halloween Ghost. 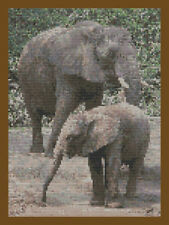 A Small counted cross stitch kit from Mouseloft. Halloween Bat. 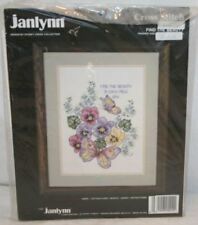 A Small counted cross stitch kit from Mouseloft. Halloween Spider. "Bruja de Halloween". Kit completo punto de cruz contado. Halloween Series- No. 42-102 KIT. Model Halloween Witch. MPN 42-102 KIT. (que tiene símbolos de buen tamaño, lo que es fácil de leer). Al realizar un pedido desde los EE. Kit completo punto de cruz contado. Halloween Series- No. 42-119 KIT. Toma una linterna de Halloween. Model Halloween Jack-a-Lantern. MPN 42-119 KIT. (que tiene símbolos de buen tamaño, lo que es fácil de leer).